Hydraulic fracturing fluids contain a variety of hazardous chemicals such as diesel fuel, acids, and surfactants. Though industry proponents assert that only a small fraction of the fluid volume used in any fracturing operation consists of chemicals, because of the large volume of fluids needed for each “frack job,” sometimes millions of gallons, the chemical components of fracturing fluid can actually amount to tens of thousands of gallons. Hundreds of different types of chemicals are used in fracturing operations, many of which can cause serious health problems, and some are also known carcinogens. In addition to the endless byproduct wastewater from shale gas operations, hydraulic fracturing can also release hazardous substances that naturally occur into the environment, such as arsenic, mercury, and naturally-occurring radioactive materials (NORMs). All of these substances present risks to underground sources of drinking water and need to be regulated properly, especially because each well may be hydraulically fractured as many as 15 times. Hydraulic fracturing is linked to several cases of groundwater contamination around the country, and in some areas where there has been hydraulic fracturing, residents have reported severe illnesses. Likewise, the process of setting up a well pad, constructing and maintaining pipelines, compressor stations, and other infrastructure all entails clearing forest landscapes and huge erosion and sediment potential. The impact of wide-spread landscape transformation is tremendous for wildlife habitat and small-order streams that criss-cross the vast majority of shale gas sites. Further, increased sediment loading cumulatively poses a threat to the health of the Susquehanna River and Chesapeake Bay. Similarly, air pollution from shale gas operations is pervasive and serious. Drilling and maintaing actual wells releases methane, a potent greenhouse gas, while transmission and storage operations all leak fugitive emissions which cumulatively impact not just local air quality, but regional air quality and contribute to global greenhouse gas increases. Compressor stations – facilities which keep pipelines pressurized to move gas – emit a variety of harmful air pollutants such as VO2, NOx, methane, and diesel fumes among others. Long-term exposure to these chemicals causes serious human health impacts. Increasing gas development in the northern Susquehanna watershed has precipitated the creation of vast miles of pipelines and compressor stations throughout the lower Susquehanna to facilitate gas movement to markets. The boom and bust nature of extractive industrial developmentÂ threatens to turn the Susquehanna Watershed into a socioeconomic and environmental nightmare. When gas reserves are tapped localities and states are likely to be left with a legacy of pollution, mismanagement, and economic poverty rivaling that of Pennsylvania’s coal history. We believe natural gas has a vital role to serve in both state and national economies and energy independence, but do not support ad hoc regulation, the politicization of what is a human health and welfare issues, and laissez-faire enforcement policies. A Pennsylvania citizen cannot turn on television, listen to the radio, or drive on a highway without seeing, reading or hearing the gas industry’s promise of shale gas wealth and its environmentally-friendly nature. Please read Food and Water Watch’s excellent report debunking the industry’s false promise of shale gas development’s economic wealth. Does hydraulic fracturing really threaten drinking water? Our watersheds? YES. In many places, hydraulic fracturing takes place on private property, even in backyards where children play or where a drinking water well is located. Depending on local circumstances, property owners have little or no leverage in determining where hydraulic fracturing operations may take place. 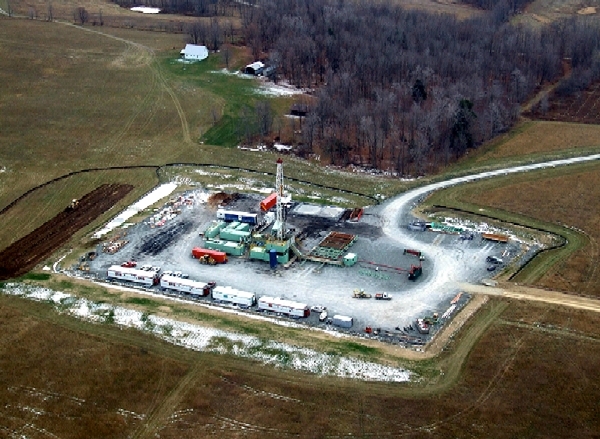 Hydraulic fracturing frequently necessitates drilling through drinking water aquifers, exposing such aquifers to the risk of contamination from the tens of thousands of gallons of chemicals typically employed in a single fracturing operation or from naturally-occurring hazardous substances. Hydraulic fracturing threatens more than just a river; it threatens watershed integrity. The indirect and cumulative threats posed by this particular type of development over time – namely the environmental impacts resulting from the construction of these sites (increased sedimentation of waterways), the maintenance during and after construction, and the disposal of hazardous byproduct wastewater – also threatens waterways and communities. For example, a typical well-pad is just under 5 acres, containing 6-9 wells. This land must be cleared, breaking apart contiguous parcels of forest and fragmenting animal habitat. Likewise, roads are built for access, pipelines installed to transport gas…the list goes on. These types of impacts, while small individually, collectively represent a serious threat to the integrity of a watershed, especially the downstream Lower Susquehanna and Chesapeake Bay.